A couple weeks ago, after All Facebook spotted the ability to check-in to Facebook events, the social network confirmed to us that the feature would be launching shortly on the iPhone and their mobile-based touch site. Today, here it is. Version 3.4 of Facebook’s iPhone app actually has a few other nice updates as well. These include the ability to view your friends on a map from the Places area (and it uses Google Maps, not Bing Maps), an “improved” News Feed, an “improved” notifications UI, and the ability to unfriend someone from your phone, finally. 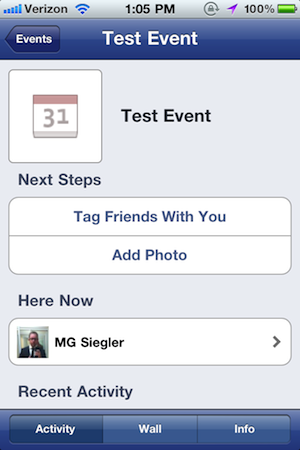 But again, the big thing is the Facebook Event check-ins. Previously, you could only check-in via Facebook Places. 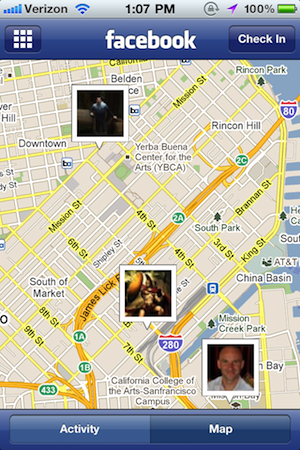 That meant checking-in to various locations around cities just like you do on Foursquare, Gowalla, Loopt, and others. But now that you can check-in to events themselves, it opens a range of possibilities. You could run contests at events through this, for example. To be able to check-in to an event you have to (obviously) be invited and RSVP’d “yes” to attending. Your location also has to match the location of the listed event venue, and it has to be the correct time of the event. All of this will presumably help dissuade gaming. 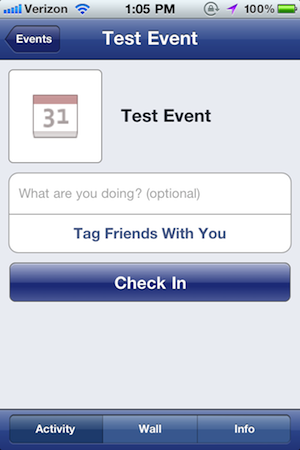 I just tested the feature out by creating a test event and it works well. Assuming you’ve met all the above requirements, you’ll see a nice big “Check In” button on the event’s page. There’s also a new “Here Now” area on the event’s page to show you who is currently at the event. And the “Recent Activity” includes check-ins as well as pictures, comments, etc. So, the next question: when is this functionality coming to Android? Facebook wouldn’t give a specific date when we talked to them a few weeks ago. This continues the trend of Android playing second fiddle to the iPhone in terms of functionality. Still, I’m sure it will launch one day. And to be fair, they still don’t even have an official app for the iPad yet — something which seems more ridiculous with each passing day. You can find Facebook for iPhone in the App Store here.